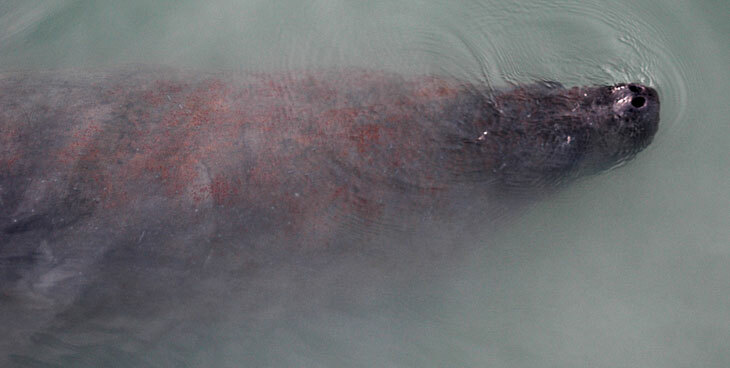 For the past eleven years, we have been stalking the wild manatee. Looking for manatees is a bit like looking for submarines. They are extremely hard to find, and when you do find one, you have only a brief glimpse of them before they disappear again underwater. Usually, you don't find the manatees. Instead, they find you. Most of the time, you see a dark shadow lurking in the shallow water, and you wonder if you really saw anything at all. Crocs, alligators, and manatees live in an aquatic Shadowland, and they revel in keeping you guessing as to whether or not they are present. These Puerto Rican manatees may not be ready for prime time, but they're not shrinking violets either. Four or five of these walrus-sized brown torpedoes put on a stunning drinking fest - proving beyond the shadow of a doubt that manatees enjoy drinking fresh water. We were standing at a dock next to two water hoses that were turned on, and the dangling ends of the hoses were submerged in salt water. 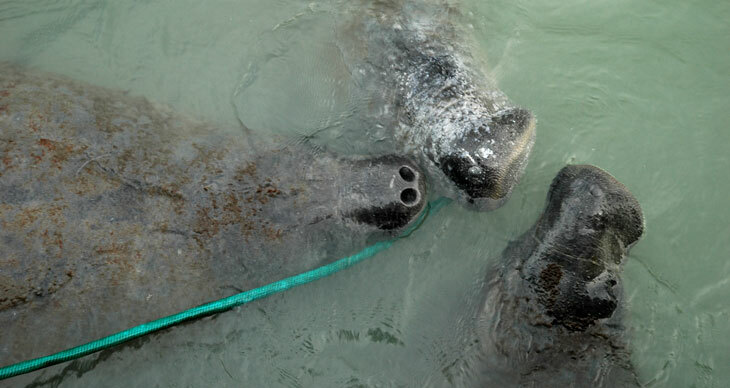 To our amazement, a group of manatees swam over to the hoses, put the hoses in their mouth, and took long refreshing drinks. Take a look at the smile on the face of this manatee. He has a water hose in his mouth and is sucking on it like it's a straw in a diet coke at McDonalds. This guy can drink salt water all day long for free, but it appears that given the choice between drinking salt water and fresh water, he will take the fresh water anytime. These three manatees are lined up, waiting their turn at the water hose. Each of them took long drinks, swam around some more, and then came back for another drink. When they have had their fill of fresh water, they release the hoses into the salt water and swim away. 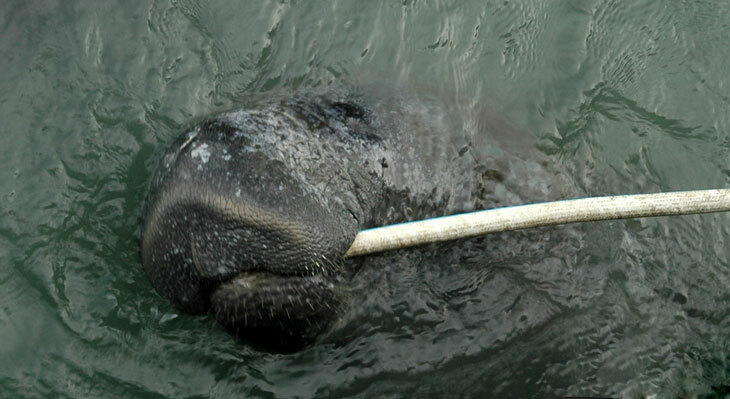 When the manatee dropped this hose, it ended up on his tail for a few second before sinking into the bay. Manatees have one major enemy - humans with outboard motors. 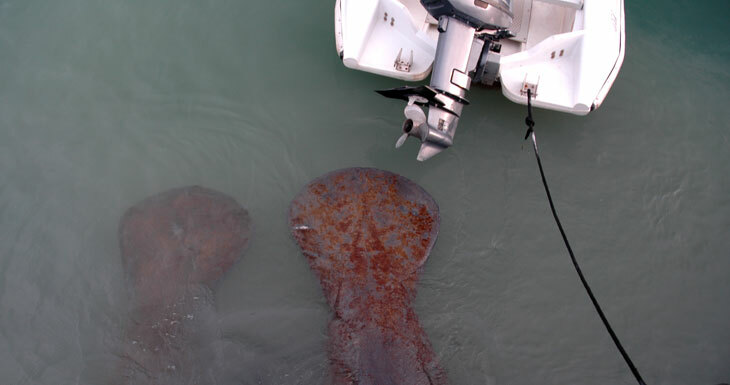 Since manatees swim slowly just below the surface, it's doomsday for them when a boat with an outboard runs over them. 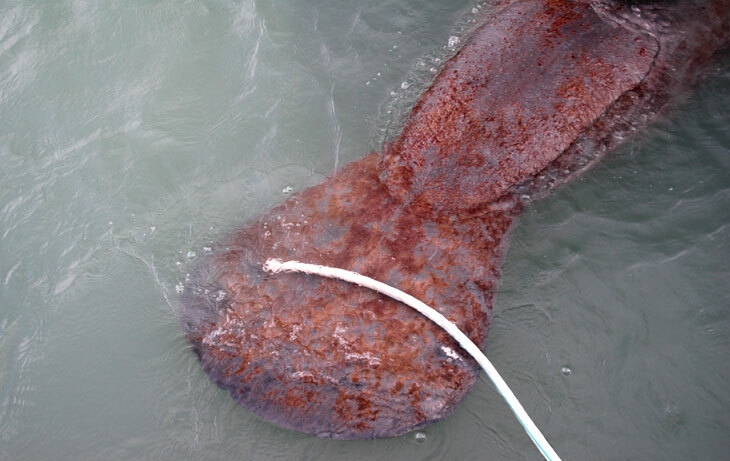 Several of these manatees had scars on their backs where propellers had lacerated their thick skin. This picture shows that it's up to us to protect manatees from outboard motors. The manatees swam around this motor and propeller, totally oblivious to the death machine just a few inches above their head. They obviously don't know that they are at risk, and that we are the enemy. Manatees are our friends and it's up to us to ensure their survival. If we do our part, the manatees will live long and prosper, and everyone will have the privilege of seeing manatees in the wild. Wouldn't it be a shame if we had to put all of the manatees in jail - protective custody in zoos - to protect them from us. Although I can't speak the manatee language, I think that I can speak for them when I say that given the option - protective custody or freedom - they would choose to be free and live in a world without out board motors.